Melvin Ott, or Mel Ott as he was commonly known, spent his entire MLB career in New York where he featured for the Giants between 1926 and 1947. The right-handed thrower and left-handed batter was the first ever player in the National League to cross the 500 homer barrier. Although he was only 5'9" tall and weighed around 77 kilograms, Ott was a fantastic power hitter during his career on the ballpark. In 1951, he received 87 per cent of votes prior to his indictment into the game's Hall of Fame. His twenty-plus years of incredible service to the Giants was repaid by the club as they decided to retire his number 4 jersey. Ott represented the All Star team 12 times between 1934 and 1945. He remains one among only six players from the National League to spend a career spanning 20 or more years with only one team. According to the list of the 100 best baseball players in history, Ott ranked 42nd. He was also nominated for the MLB Team of the Century. After Ott was done with his playing career, he entered the broadcasting business and covered the Tigers' games on television as well as radio. Ott sadly passed away in a motor accident in 1958, in a way similar to the deaths of two other Hall of Fame inductees who represented the New York Giants – Carl Hubbell and Frankie Frisch. Ott was honored in Gretna – his hometown where the government decided to name a park in his remembrance. In addition, the highest home run scorer in the National League is awarded with the Mel Ott prize, further honoring one of the biggest legends of the game. In 2006, Ott featured on a postage stamp in the US along with three other players in honor of "Baseball Sluggers." 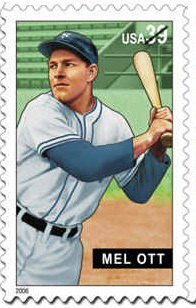 The players who also featured on the stamp were Roy Campanella, Hank Greenberg, and Mickey Mantle. When the stamps were being announced by the Postal Service in the United States, the authorities said that they were being released to remember the powerful sluggers who mesmerized fans with their amazing and record-breaking homers. It was also said at the unveiling that the men were versatile players and played a major role in leading their respective teams to glory while setting magnificent new standards for the following generations. When Mel Ott passed away in 1958, the Mel Ott Little League commenced a year later to honor the legend. During his wonderful career, Ott notched up 12 appearances for the All Star team. 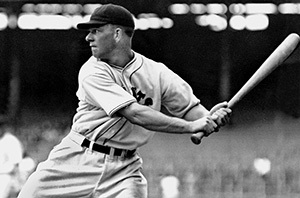 Between 1932 and 1942, Ott finished as the home run leader in the National League on six different occasions. He became the first player to score 500 homers. He was also the youngest slugger to hit 100 home runs. He holds the MLB record for leading the Giants' seasonal scoring charts for 18 consecutive years. Ott also managed the New York Giants for seven years between 1942 and 1948.